Personally I find it to be a complete lack of understanding for acting. I also find it rude to try to create some kind of a sound byte for such a tragedy. 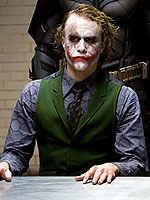 The man was a complex man, he was a good man, but you know what, I saw him having nothing but the best time playing the Joker. He looks and talks like a sleak sportsman. Christian Bale. If all leading men were as classy, we’d live in a better world.